I attended a class on building a spoke shave (taught by John Gunterman) and got hooked. They are nice projects that don’t require much time, materials and even skill. Because of this I find myself making them more and more. The main drawback is paying $30 per blade. Since I’ve had good success making the blades for most of my plane projects I started making spokeshave blades as well. Here is a sampling of some of the shaves I’ve made (the one at the top is an antique Sheffield that I used as my model). The shave below it is the first one I ever made (done during the class). It is made of some nicely figured curly maple. The shave below it is a scaled down version made of Kingswood. Its size it just right for smaller scale work. Used for working tight inside curves this spoke shave has a rounded sole in front of the cutting iron. 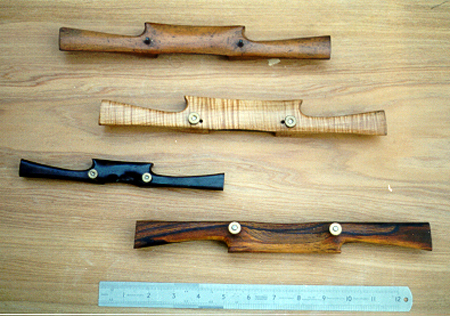 The wood used in its construction is cocobolo. Similar in looks to a spoke shave a cabinet scraper has a thin blade mounted almost vertically to produce a scraping action rather than the typical cutting action of a shave. They are used for much finer work where only a small amount of material can be removed (but they can be set to "hog" off shavings at a surprising rate!). Because they scrape rather than cut they are more suited to harder wood and are particularly effective at working difficult, gnarly grain. Of all the different styles of cabinet scrapers my favorite is the "Ram’s Horn" style. Not only does it look good but it’s a very comfortable (ergonomic) style to use. The curved "horns" fit right in the palms of your hands. This is a more delicate design used for finer tasks, especially curved work. I made the "shoe" (the brass block that holds the blade in place and creates the mouth) with a particularly fine mouth opening. The body is made of cocobolo. This scraper is a much more "robust" version, capable of removing quite a bit of material quickly or thin, wispy translucent shavings. This shave was built using an old antique manufactured Ram’s horn scraper as its model. I used the original cast iron shoe and blade. The original was most likely made by Atkins but many manufacturers’ offered similar tools. This style of shave was the predecessor to the Stanley #80 (which, of course is all cast iron). I made the body of this shave from a piece of nicely figured Persimmon (this wood was once very popular for the construction of golf club drivers because it is so tough and split resistant). Since the piece of Persimmon I had was not quite thick enough I added a sole of Ebony (which Persimmon is very closely related to – often referred to as "American Ebony") which was attached with a sliding dovetail joint. The original had a piece of stiff leather inlet into the area just above the sole and behind the blade. This was used to force the blade into a slight bend which helps the scraper cut more aggressively. Since this arrangement only allows for a set level of aggressiveness I chose to solve the problem of blade adjustment a bit differently. Borrowing from the design used on the Stanley #80 that used a thumb screw to adjust the curvature of the blade I bored and tapped for an Allen screw. You will notice the small hole located opposite the blade just up from the sole. To adjust the blade curvature (aggressiveness of cut) you simply insert an Allen key into the hole and turn the screw. Works like a charm! thought a few hours spent on something from start to finish was in order). It's what I call a "Gunstock" scraper. Last year I picked up an old model that was well beyond usability. The hickory body was badly cracked and not worth fixing. You can see it just in the background. Really got it more to use as a model and to perhaps salvage parts from (but the only thing useable on this one was the metal toe piece - and it was pretty marginal). I made mine from some nicely figured Kingswood (the figuring is completely lost in the picture). The only thing I was able to use from the original was the toe, but it's mouth is a bit wide. I've since made another one from brass using the same general dimensions and design. It has a much tighter mouth. This small scraper (the body is a mere 7/16" X ½" in cross section!) is really useful for shaping handles and such when I make hand saw handle or ones for bow saws (even plane totes! ).